"India is home to over 340 million destitute people and is the second poorest country in South Asia after war-torn Afghanistan...In South Asia, Afghanistan has the highest level of destitution at 38%. This is followed by India at 28.5%. Bangladesh (17.2%) and Pakistan (20.7%) have much lower levels"
GDP growth and increases in per capita income and human development index are often used as indicators to represent improvements in the lives of ordinary people in developing nations in Asia, Africa and Latin America. Both of these have significant limitations which are addressed by Oxford Poverty and Human Development Initiative (OPHI)'s MPI, multi-dimensional poverty index. How come you have ignored WEALTH TO WELL BEING data which is the premise and the title of the Report? The second very important data set is the LONG TERM SUSTAINABILITY SCORE, which was also conveniently ignored. The GROWTH TO WELL BEING data should not be used by itself because it has much more variation (pg 18 & pg 21) as the authors acknowledge. For example, GROWTH TO WELL BEING COEFFICIENT cannot explain why Denmark(0.80), Malaysia(0.87) and USA(0.97) are all lower than Syria(1.00), Malawi(1.09) and Mali(1.20). MJ: "How come you have ignored WEALTH TO WELL BEING data which is the premise and the title of the Report? The second very important data set is the LONG TERM SUSTAINABILITY SCORE,"
If you listen to Modi and his BJP henchmen, the GDP growth is the most important of all. They are even willing to fudge the numbers to show they are growing faster than China. Even the Indian Central Banker Rajan questioned the GDP figures and the exclusive focus on it by the Hindu Nationalists. "... there is the problem of bad data. Rajan’s predecessor, Duvvuri Subbarao, blamed bad data for some of his bad decisions. So one can’t even be sure if Rajan has been behind the curve based on past CPI or WPI (Wholesale Price Index) or GDP trends. Till recently, the WPI has been in deflation territory, while CPI has always been positive. GDP has been buoyant, but many underlying indicators (the Index of Industrial Production, exports, etc) indicate the need for softer interest rates. While the WPI has been abandoned as a guide for inflation targeting, there are now doubts about the new GDP series that uses the gross value added method for arriving at GDP estimates. So Rajan is right to question the GDP obsession of politicians. The Modi government may want to claim an economic revival and use the latest GDP numbers (7.6 percent) to good effect, but the reality is that GDP growth does not matter even politically, unless other markers of “achche din” are also visible. These would be about jobs and real incomes"
India’s employment growth is beginning to show signs of a slowdown even as official data showed a pick up in GDP growth, according to a study by Care Ratings. Jobs growth slowed to near-zero during 2014-15 in a sample of 1,072 companies. These companies created only 12,760 jobs in 2014-15. In the previous year, they had added 188,371 jobs. Employment growth in the sample slowed to 0.3%, the slowest in four years, an analysis of the annual reports of the companies surveyed in the sample by the ratings agency showed. The number of jobs in manufacturing sector companies in the sample, despite the government’s ‘Make In India’ push, declined. Employment growth in the manufacturing companies plunged to (-) 5.2% in 2014-15 from 3.2% in 2013-14. Manufacturing accounted for more than 40 per cent of the jobs, the highest share in employment, followed by banking (23.0 per cent) and IT (18.4 per cent). “This means that the future of job creation would largely be dependent on the growth in this sector and the low growth in the last 3 years is a cause for concern,” according to the study. In the current financial year, 2015-16 too, growth in the sector has ranged around 3 per cent. The study on trends in employment in the last four years is based on employment numbers provided by companies in their balance sheets. It does not include the impact of outsourcing. One reason the study gives for job creation not showing on the books of companies is the possibility of more jobs getting outsourced—in which case it would be accounted for elsewhere in the suppliers’ registers. Jobs that were performed by employees such as security, administrative functions and back office, are increasingly being outsourced in many companies. However, the findings of the latest quarterly survey by the Labour Bureau in the Ministry of Labour and Employment do not support this argument. The survey released last month shows a decline of 21,000 in contractual jobs during January-September 2015, against an increase of 1.20 lakh in the corresponding period of 2014. That did not answer my rebuttal. India or its politics is not my subject. The academic argument is the incorrect application in your analysis. SQA: " talk to me when Pakistan's exports pass the 100 billion dollar mark"
Volume of exports has nothing to do with the issue f translating economic growth into citizens' well-being. What is needed are policies for better distribution of the benefits of economic growth among the middle and low income groups. It means policies to create better-paying jobs, collect taxes, and spend on skills and education, health care and a basic safety net to help the most vulnerable in society. With an investment of 46 billion U.S. dollars and scores of infrastructure projects, the ongoing construction of the China-Pakistan Economic Corridor (CPEC) is undoubtedly one of the largest endeavors now taking place on the planet. Roads, energy projects, industrial parks and the Gwadar port are all included in the basket, satisfying Pakistan's immediate needs as well as helping the south Asian country get back on its feet after years of anti-terror campaigns wrecked its economy. Three years after the initiative on the construction of CPEC was jointly announced by China and Pakistan, Xinhua has learned that the project is yielding its early fruits as new roads and power plants have put Pakistan's growth in the first gear. Located 20 km east of Pakistan's largest city of Karachi, the Bin Qasim power plant is one of the pioneer and flagship projects of CPEC planned to begin operating at the end of next year. For the coal-fired plant built by PowerChina, the Chinese construction company commissioned to undertake the construction of the project, two 660-megawatt generator units will be installed, which would generate 1,320 megawatts of electricity per year, more than a quarter of the 4,500-5,000 megawatts of power shortage estimated for the year 2012. "With three more plants like this one, Pakistan would have no more energy woes," said Chen Enping, a manager at PowerChina. For Sher Afzart, a shop owner in northern Pakistan's Hunza Valley, the Karakorum Highway is what he owes his livelihood to. The two-lane highway, originally built by the Chinese in the 1970s and recently renovated by China Road and Bridge Corporation, connects Kashgar, a commercial hub in northwest China's Xinjiang Uigur Autonomous Region, and Pakistan. Afzart can save days on trips to Kashgar to buy goods as the road cuts through the Karakorum mountains. There is a steady flow of business as thousands of Chinese workers labor around Hunza. Following the completion of the Karakorum Highway renovation project, more business opportunities are created, Afzart said. "With the convenience of road traffic, I'm thinking of opening branches in Islamabad and even in cities farther south," he said. The Karakorum Highway is just one of the roads that falls under CPEC. The M-4 National Motorway, a strategic artery in central Pakistan, is also being paved by the Chinese. The Gwadar port, located in the southern coast of Pakistan, is where CPEC meets the Indian ocean. From here resources can commence their journey onto the hinterlands of Pakistan and western China, and Chinese and Pakistani products can be shipped out to every corner of the world. Viewed from above, the port is like an anchor protruding into the emerald waters, forming two natural bays that are as deep as 14.5 m, making them perfect harbors. After the CPEC cooperation program was launched in 2013, a plan was developed in the following years to comprehensively transform the fishing town into a modern metropolis complete with industrial zones, a harbor and recreational zones. Gwadar Port Authority Chairman Dostain Jamaldini has big ambitions for the port, eyeing Dubai, which is just across the Arabian Sea, as a model. Near future plans for the port area include the construction of a Free Trade Zone, a Special Economic Zone, a coastal expressway, an international airport and a pipeline linking Iran, which are all part of the CPEC plan remodelling the town which will be the hinge of the corridor. "Pakistan is ready to offer the most generous terms for companies investing in the port," Jamaldini said, "We believe the favorable policies and the superb location of the port will soon attract the interest of investors worldwide." Where is the question of translating GDP growth to well being when there is no growth at all? You cannot fill your empty stomach with hot air. 19640909rk: "Where is the question of translating GDP growth to well being when there is no growth at all? You cannot fill your empty stomach with hot air"
First, your claim of "no growth at all" is bogus. The critics are not claiming there was no growth; instead, they are claiming it was lower than the government figures. Second, I tend to agree with the government, not the critics in this instance. Why? Because other broad indicators of growth reinforce government's claim. Pakistan better than India in inclusive development. 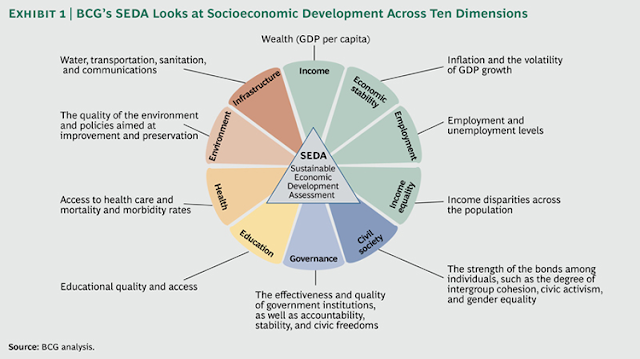 The Inclusive Development Index (IDI) is based on 12 performance indicators. 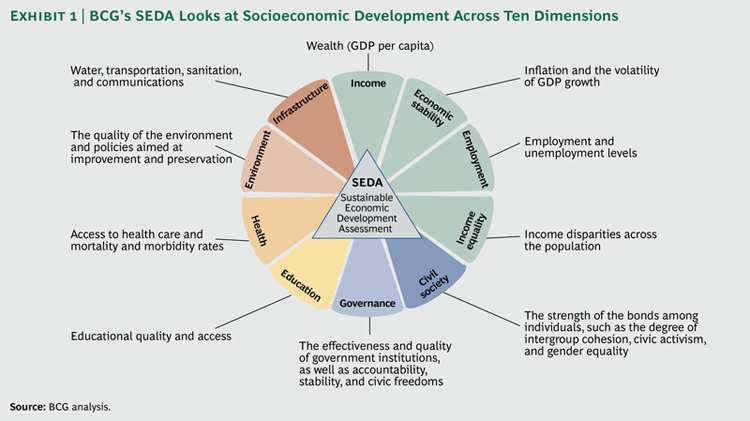 In order to provide a more complete measure of economic development than GDP growth alone, the index has three pillars — Growth and Development, Inclusion and Intergenerational Equity, and Sustainability.